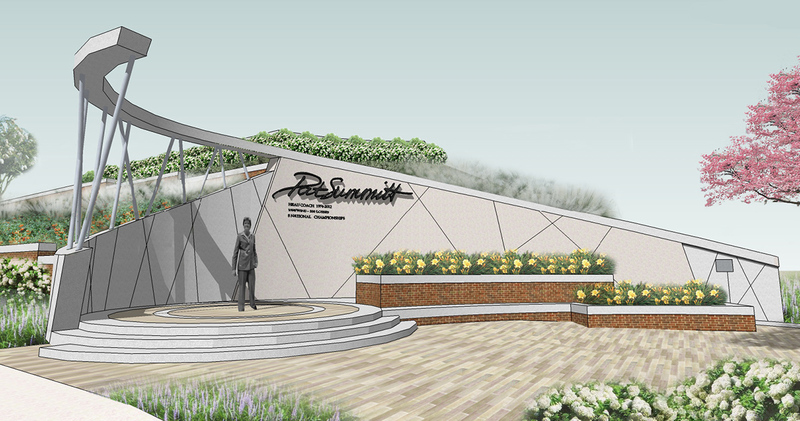 Create a plaza to recognize the accomplishments of UT Women’s basketball former head coach, Pat Summitt, and create an engaging, timeless entrance to campus from Neyland Drive. 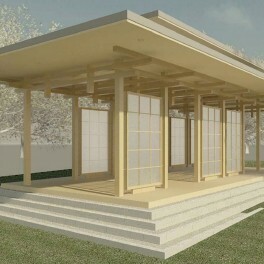 Discussion begin for Summitt Plaza in 2009 after Summitt’s 1000 career victory, but it wasn’t until 2011, when she announced her diagnosis of early onset Alzheimer’s and the hiring of Dave Hart, Vice Chancellor and Director of Athletics, that the push for concepts started rolling on the plaza. From the beginning, the plaza was described as one of “class and elegance” and when Coach Summitt announced her intentions to step down in 2012, it was time to start construction. About 2500 photos of Coach Summitt were sent to the sculpture artist and several discussions were held as to what would be said on the back wall. 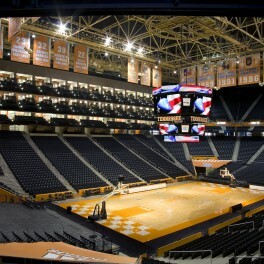 The decision was made to include the milestones that appear on a banner in Thompson-Boling Arena, the years of her career at UT, her win/loss record and the number of National Championships won during her career. The addition of her back lit signature made it so there was no doubt who the plaza was honoring. The plaza evokes the shape and strands of basket ball hoop with the statue of Coach Summitt situated in the center, looking towards the arena, always providing a watchful eye. 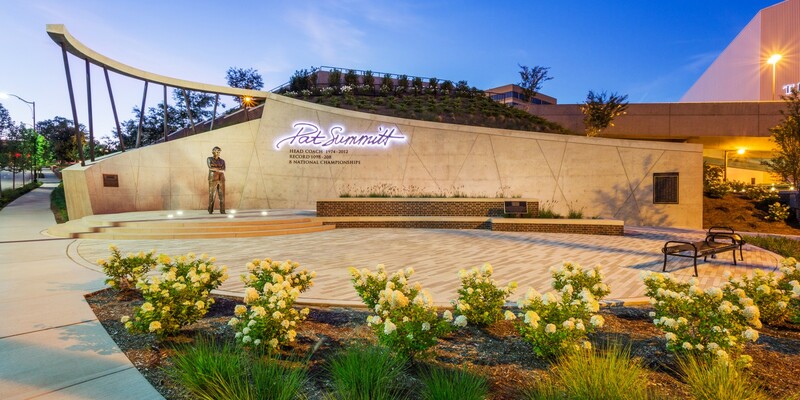 The entire site, extending up Lake Loudon Boulevard, received new terracing and landscaping and site lighting, including the lit signature, allows the plaza to be an active location, even after a night game. 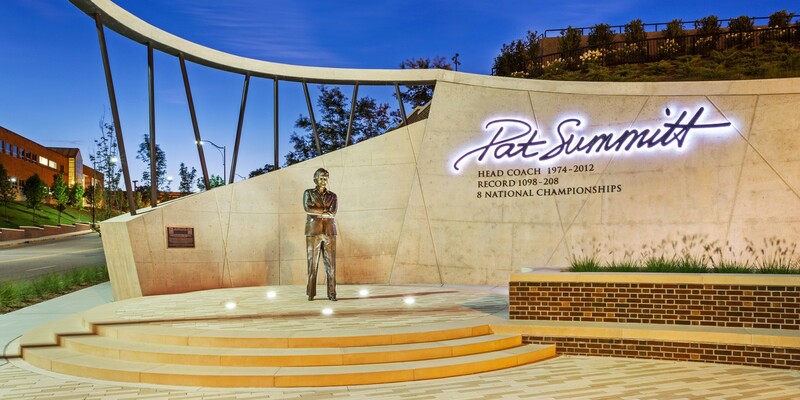 The statue was placed on the site in the cover of night and the unveiling occurred via a procession, lead by Coach Summitt, to the plaza from Pratt Pavilion in the fall of 2012. 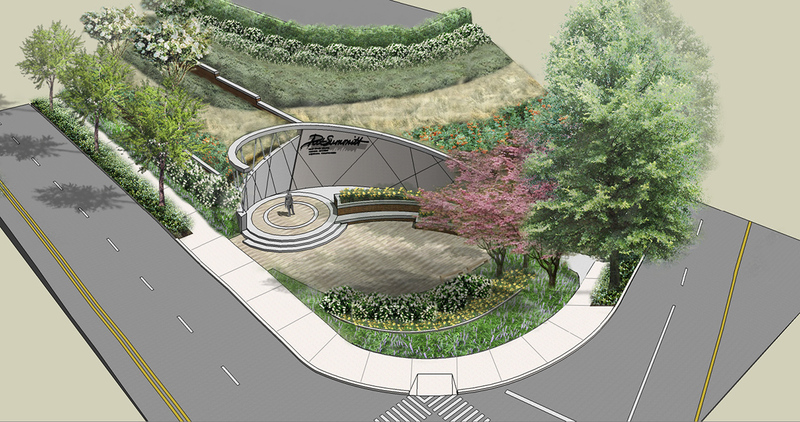 S4D and landscape design partner, CRJA, took an underutilized area of campus, adjacent to Thompson-Boling Arena and a main entrance to campus, and carved out a space that would engage both pedestrian and vehicular traffic. 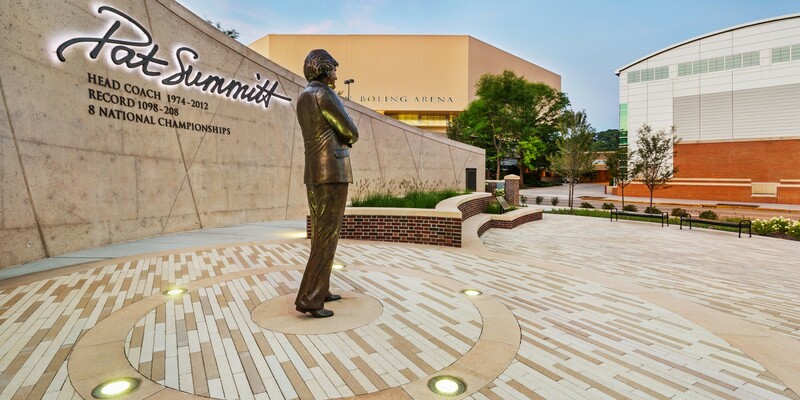 Beyond the beautification of the corner, the plaza represents Coach Summitt and allows former, current, and future players and fans to share in her historic career.